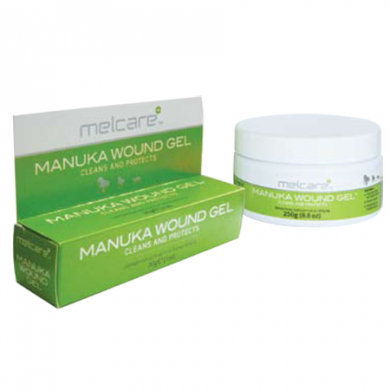 Melcare’s Manuka Wound Gel removes barriers to healing and stimulates the healing process. The low pH and high osmotic potential helps protect the wound from contamination and colonisation by bacteria. It also rapidly deodorises wounds to help protect them from fly strike. 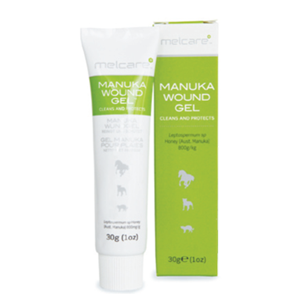 Melcare’s Manuka Wound Gel is made from genuine medical grade manuka honey (80%) and contains natural oils to protect wounds and seaweed to enhance the honey’s properties as a wound dressing. The medical manuka honey is minimally heat treated to preserve its natural properties. 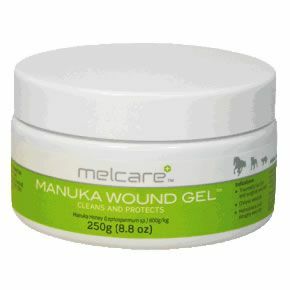 Melcare’s Manuka Wound Gel is the dressing of choice for wound cleaning and protection. Apply a generous quantity (approx. 3 mm layer) directly onto the wound or an appropriate dressing.